If you believe in communal harmony, you will find inter-religious harmony at every nook and corner in India. You will find innumerable examples among your friends, acquaintances and in your neighbourhood. It is not about Mumbai alone. In other cities too, it is a common sight, to see people participating in construction of tableaux. Similarly, if you don't believe in this idea, and somehow feel that there is eternal conflict between certain religions and their adherents, you will not be able to see this beautiful and syncretic culture, which has always thrived in India. See the photograph on the left. It is about the Ganpati celebration in Mumbai. The hoarding has the names of organisers. There are Aditya and Shyam, along with Obaid Khan and Farhan Mirza. With them is Anthony D'sa and Nafis Syed. Many of us walk past such hoardings without casting a glance. For cynics, even this may not be enough. But this cultural unity is part of our daily lives in India. On social media, especially, Twitter, we encounter people who give an impression as if different communities are always at loggerheads and have nothing common. Now there is the second photograph below. It shows banner of an organisation congratulating Muslims on Ramzan. 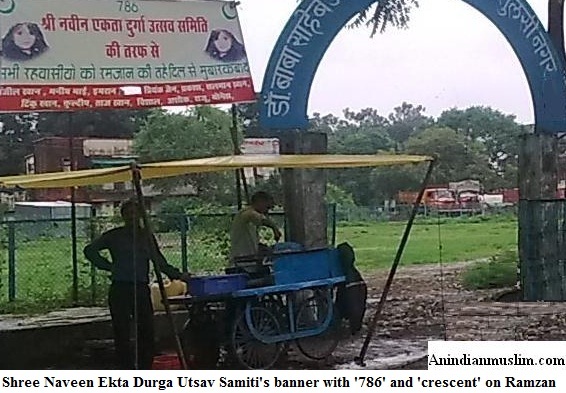 The organisation's name is 'Shree Naveen Ekta Durga Utsava Samiti' and along with the Goddess' photograph, it also carries '786', 'crescent' and the message for Muslims on Ramzan. They are not politicians, who are trying to seek votes. They are all ordinary individuals, who have friends of different communities, and who share each others' pain and pleasure. 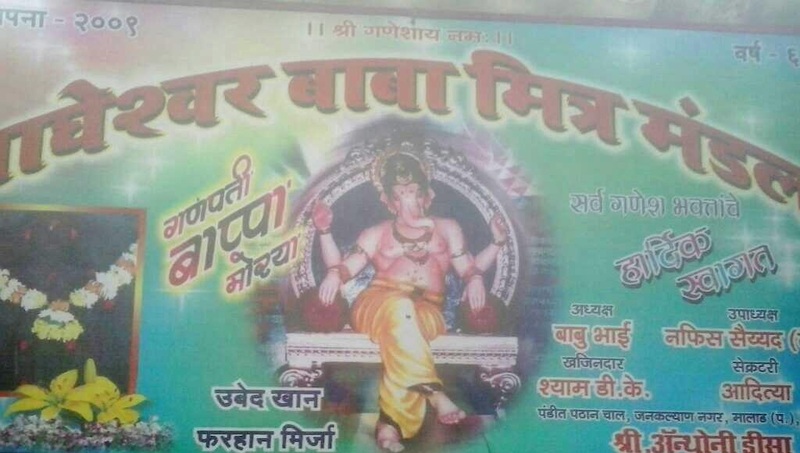 It is not about Ganesh Chaturthi alone but is true for most festivals in this country. Yes, this is the real India. The virtual world may give you the impression that Hindus and Muslims are always arguing, fighting and accusing each other. But reality is that the hate-filled Tweeples can't even put up a banner or a hoarding, let alone organise events on the street.They may spread hate round the clock, but can't come out of their bubble, to do something constructive that can enrich the lives of the people. The real culture, the shared heritage is there on the street. This is the true Indian culture.